Moments after Saturday night's Eye Ball party across from the Joule Hotel started, people were breaking things. A line formed at the gated entrance and each patron was given a shot glass made of ice, slippery and filled with a fruit-flavored spirit. Attendees were told to guzzle and throw the ice glass down, beginning their foray into the annual arts party with a celebratory smashing. The initiation was part of the larger theme for this year's party, Día de Muertos (Day of the Dead). Ordering a Modelo or Dos Equis, you were met by a handsome bartender adorned with skeleton face paint. Titled "Aye Eye Aye," the party featured a large multiseat swing set, giant skeleton puppet, street tacos, and plenty of pan dulce. Presented by the Headington Cos. with costumes and models by Dallas fashion legend Jan Strimple, the Eye Ball serves as the closing affair of sorts for the Dallas Art Fair, and unites revelers of creative, collector, and business backgrounds for a celebration of the arts. The music portion was kept secret, with even the PR staff unaware of who would be performing until 10 minutes before it happened. And when it did, the performance outdid years past. An ominous box sat in the middle of the bar area, quiet and mysterious until the clock struck 9 p.m. Fog began to creep out of the top as musician Yayo rose from the box, wailing on an electric guitar. The longhaired musician managed to do what last year's performer could not, captivate the crowd's attention for the duration of the set. Bulladora festival creative director Kris Norvet took over music booking responsibilities this year and succeeded by keeping it lean and surprising. "I have known Yayo just over a decade," she told me. "I was working at a rock 'n' roll fantasy camp, and a 14-year-old kid walks in from Austin. You have all these old-school rock 'n' rollers, and this kid shows up to the camp and blows all these people away." Adding to the tunes, the party employed a model with prop headphones who pretended to DJ off to the side, while a pre-set playlist played songs which, at a different event, might have been a tad too syrupy, but together provided a playful Latin backdrop to the party. Pitbull, Shakira and Spanish covers and remixes of popular songs provided the soundtrack to a night of celebration. 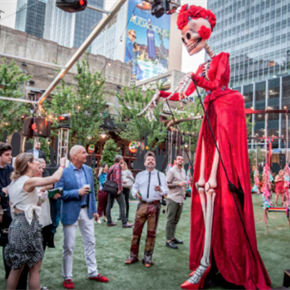 As Dallas and international power players like Culture Hype founder Amber LaFrance and Dallas Contemporary's Justine Ludwig mingled, one could take in the magnitude of Dallas arts capital under the open air. The evening's best surprise? That came at the very end, when hometown hero Leon Bridges made an appearance on one of the gala's colorful swings.